Steal a tie from dad's stash or get one on the cheap from a thrift store and turn it into this clever necktie cell phone case. This Father's Day craft from Tiffany Threadgould would be a great gift for the tech-savvy dad. Find this project and more ideas like it in 8 Necktie Crafts and Ways to Repurpose Neckties. Lay the tie on a flat surface, the wrong (seamed) side facing up. With your ruler, measure 12.5 inches from the bottom point of the tie. With your washable marker, draw a line across the tie at that point, and cut with scissors. Set the upper, skinny portion of the tie aside for another project. With the wrong side of the tie still facing up, make a fold .5 inches down from the cut end. Sew in place with a running stitch. Flip the tie back over onto its right side. Place a large button about 2 inches down from the sewn edge. Sew this button into place. Flip the tie over so the wrong side is facing up and the pointed end points away from you. Fold up the bottom 4 inches of the tie and stitch up the left and right edges to form a pocket. The button should be on the front and center of this pocket. Tie the ends of a 3-inch piece of thin elastic cord together in a double knot, or use a ponytail holder. Attach this piece to the project by sewing the knotted end of the cord, or any part of the ponytail holder, onto the inside edge of the pointed tip of the tie. The pointed end of the tie is now a top flap to the gadget case and the elastic cord is now the fastener. Flip down the flap and hook the cord over the button to secure your gadget in the necktie holder. This new necktie case will really dress up your favorite gadget! 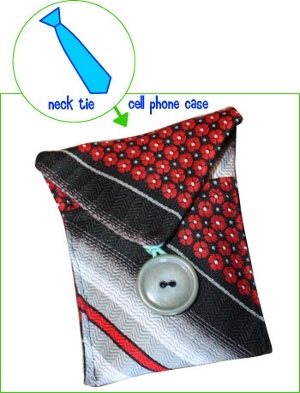 Father's Day is just around the corner and here is a quick and easy gift for the kids to make him using a necktie to make a cell phone case. If he has a tie that has memories this is a good way to recycle it into something he can use everyday. Kids love to create so let them use their imagination. You can even have other moms bring a tie and have a kids play date and make dad a gift. I will problary use my maachine instead of sewing by hand. These are awsome! I made 30 of them for my son's school's Christmas craft fundraiser. They sewed up really fast and sold even faster. I got the ties from the goodwill and even made some from some dishtowels that had a cute pattern on them from the dollar store. I just cut them into the proper shape. Thanks for the great pattern!